During the day we need to ensure that we have a meal that has a balanced distribution of the three macronutrients: Protein, carbohydrate and fat. As the day progresses our requirements for energy gradually decrease (we don’t need to eat carbohydrate for energy later in the day generally speaking). So the idea is to reduce the amount of carbohydrate in each meal throughout the day until for your last one or two meals you have zero carbs (check the evening meal section for ideas). If you do eat carbohydrates close to bed time, the chances are it will simply sit in your stomach and mostly turn to fat (we don’t use much energy while sleeping). Try to have smaller meals, more frequently; this will assist in boosting your metabolism and also provide a more usable influx of nutrients. Generally speaking it's considered best to eat every three hours. Protein sources: eggs, fish, white meats (chicken, turkey), lean red meat (try and avoid overly fatty cuts of red meat), whey or blended protein. Protein is the most important nutrient and should be the base of any meal. 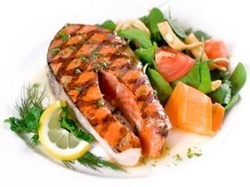 For further information about the importance of protein in a diet see here. Carbohydrate sources: Rice & pasta (brown is better), oats, sweet or regular potato, cereals, whole grains (stay away from bread). Rice-cakes and oat-cakes are very handy options for carrying with you; see the store for more details. More info on carbohydrates can be found here. Fat sources: In most cases adding additional sources of fats to meals is unnecessary, most meat will contain a moderate amount of fat and the most cooking processes involve adding fat (olive oil) to the food. If you are having meals with zero fat such as lean chicken breast, salad and oats – you can simply add a fish oil or flax seed oil capsule to provide a source of healthy fats. Good fat sources include: oily fish, avocado, extra virgin olive oil, real butter, olives and nuts. For more information about fats please have a look at the macronutrient page. “Saying food tastes healthy is like saying that a girl has a nice personality” – Quote from someone close to me, it made me laugh and I have to admit it can be that way, but it doesn’t have to…A salad, for example, might sound boring but the amount of flexibility and variety of ingredients and dressings means that with a little creativity and a few safe choices you can have one of the healthiest meals possible and enjoy it! As I said salads are incredibly versatile, you can add rice, potatoes or cous cous if you need to include carbohydrates (I keep my salads carb free and simply add carbs if I need to; daytime meals). 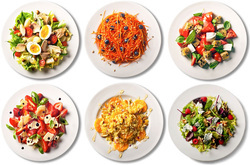 Salads are obviously rich in fibre, anti-oxidants and vitamins (raw veggie goodness) – they aid the digestive process (which for those of us on high protein diets is very important). You can also add chicken, fish, egg and tofu to provide a protein source – or if you have a meal with a separate source of protein (a steak for example) just add a couple of handfuls of salad on the side. As if that wasn’t enough it’s also a massive time-saver, for those of us eating 6-8 meals in a day it becomes time consuming to prepare greens to go with every meal (which is the ideal scenario). So? Simply make a large bowl of salad and leave it in your fridge to be picked at and added to meals as you please.